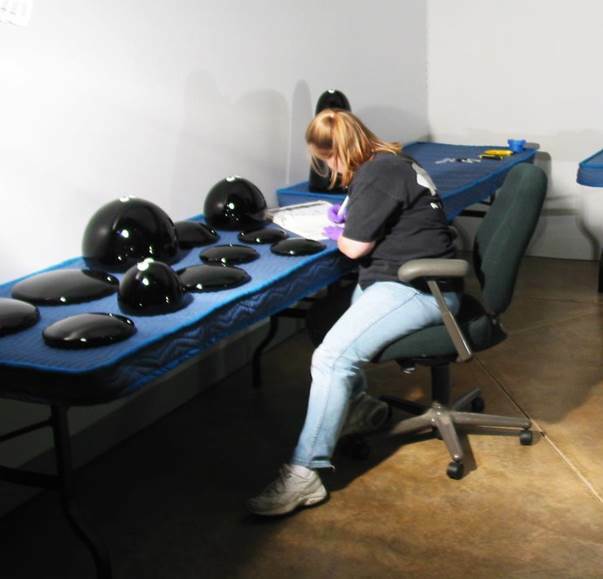 As part of our ongoing series on the care of artwork at Museum of Glass (MOG), this post reviews the methods that we employ for protecting our collections from thieves and vandalism. 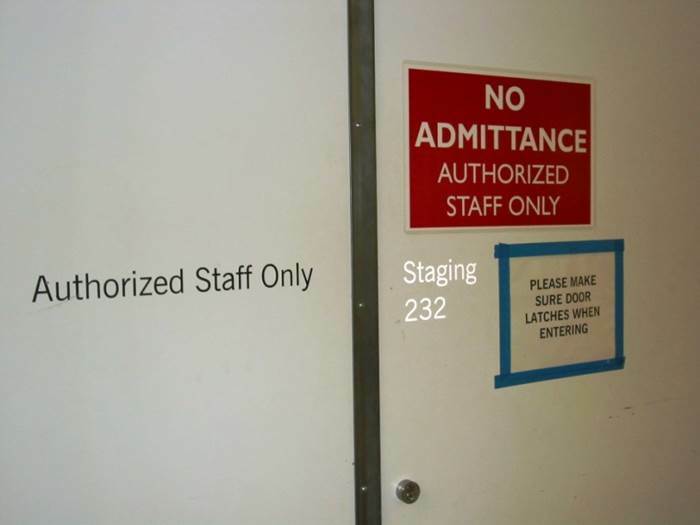 When not on view, artwork at MOG is stored in a secure space with limited access. It is always a delicate balance between putting artwork out for visitors to enjoy today and protecting pieces for future visitors to appreciate. 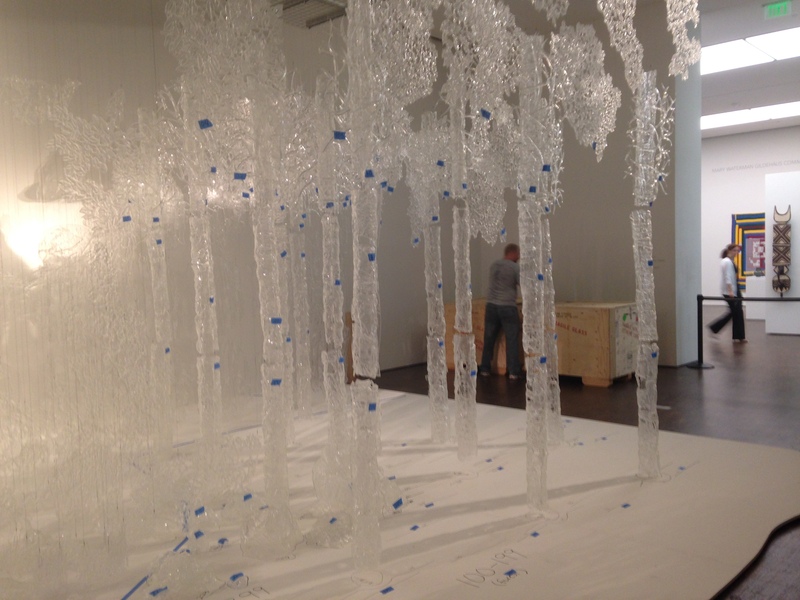 This explains the myriad of Plexiglas® vitrines and metal barriers you often encounter in MOG’s galleries: they protect artwork while it is out on display. 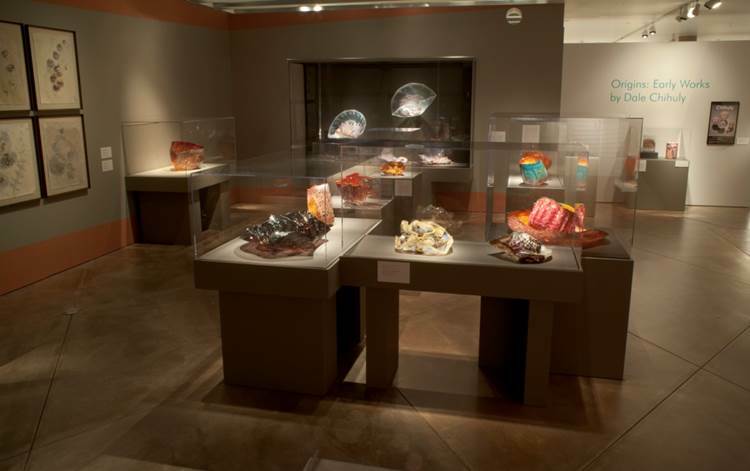 Dale Chihuly’s artwork from our exhibition, Origins: Early works by Dale Chihuly, 2009, rests safely inside Plexiglas® vitrines in the gallery. Sometimes it is not possible to fit artwork inside a vitrine, so we use metal railings (stanchions) to encourage visitors to stand back and enjoy. Lots of artwork comes in and out of MOG for our exhibitions and storage in our Permanent Collection. Each of these objects is logged into our database and tracked as it makes its journey. 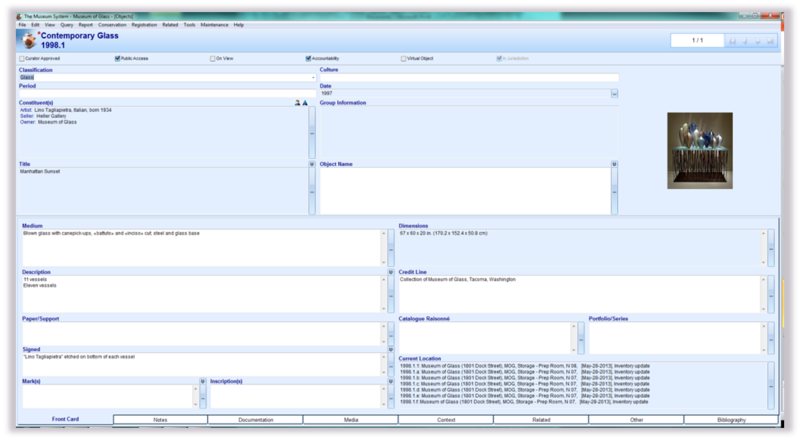 Screen shot from MOG’s The Museum System database. 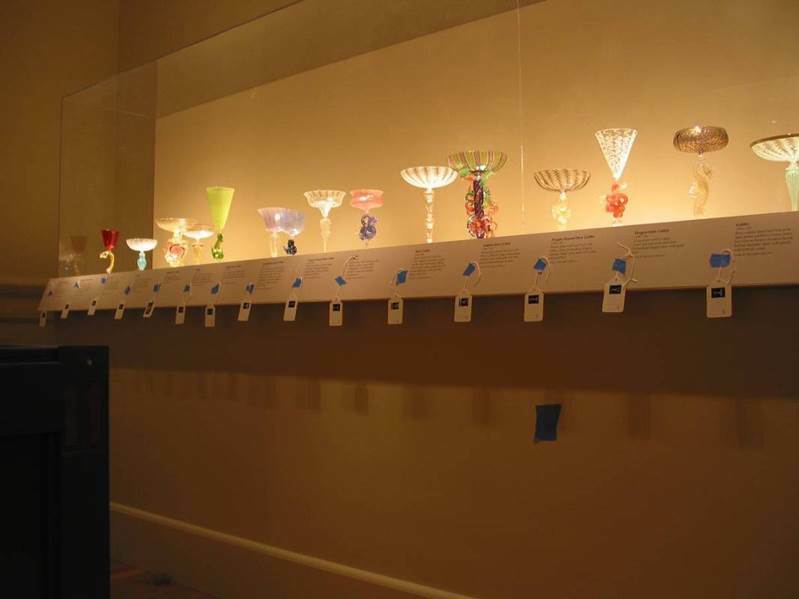 Goblets from the traveling exhibition Lino Tagliapietra in Retrospect: A Modern Renaissance in Italian Glass are tagged for inventory control prior to deinstallation at the Renwick Gallery in Washington, D.C., 2008. 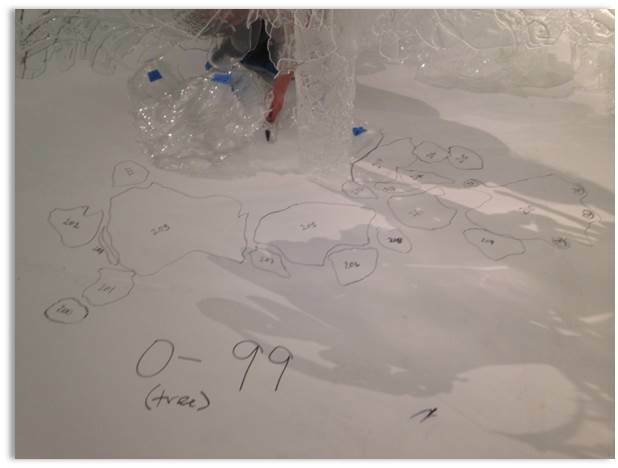 This ensures that each piece is packed in the correct box and tracked as it is shipped to the next venue. 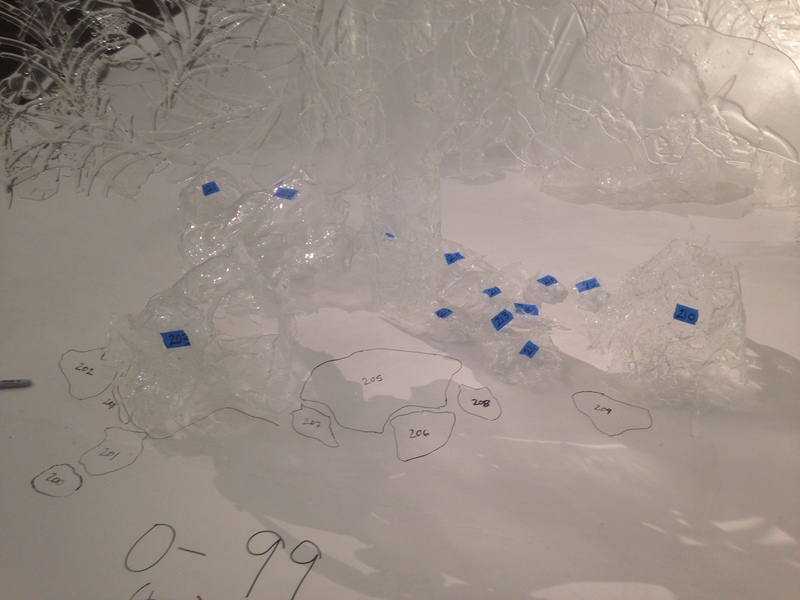 Registrar/Collections Manager completes condition report of work by Fred Wilson from the exhibition Mining Glass. Before pieces of art are packed and shipped, each component is inspected and any concerns or details are noted on the condition report. The process is repeated after the piece has arrived safely at the next location, and ensures that the artwork stays safe. The information tracked by the Museum not only forms the historical provenance of the artwork, but is invaluable in the event of a loss or damage that either requires repair by a conservator or filing an insurance claim. These methods of inventory control also protect against a condition called “disassociation”. Disassociation results from the natural tendency for ordered systems to fall apart over time. 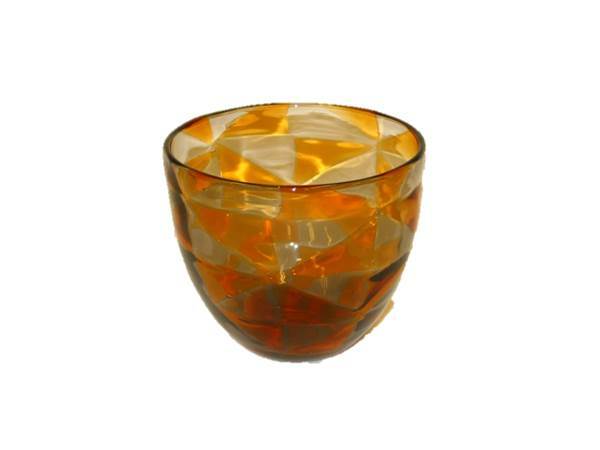 Objects in museums which have been separated from their history or meaning have limited historical or cultural value. 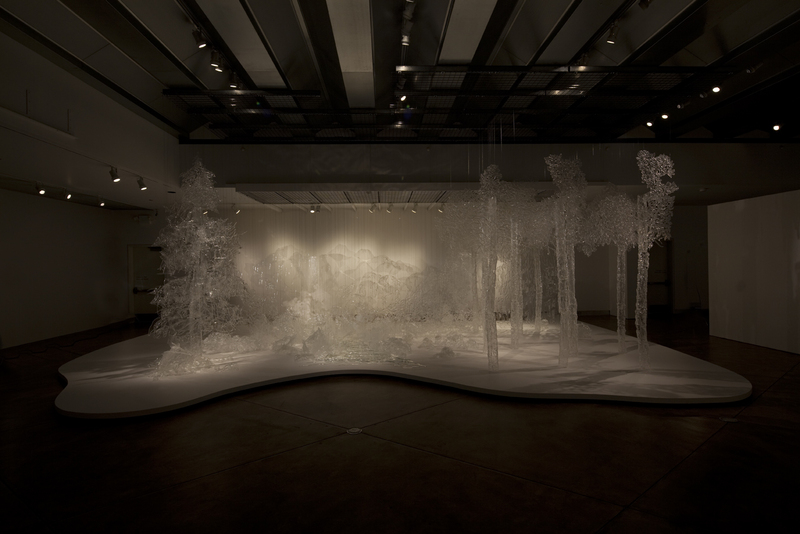 For example, the amazing installation Landscape, created by artists Ingalena Klenell and Beth Lipman in 2008-2010 (now in the Museum’s Permanent Collection) and composed of over 400 individual pieces of glass, could become a pile of scrap glass if it was separated from its inventory control sheet and installation map. Or this bowl, which we know is made by Barovier & Toso, one of the oldest Venetian glass families, loses its significance if we don’t retain that information for future generations of museum staff, researchers, and visitors. 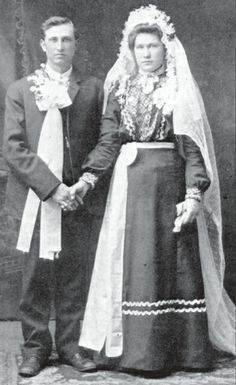 Much like those photographs of mysterious ancestors that find their way into antique shops,if you don’t know their names and the names of their descendants, the photos lose much of their historic value. Stay tuned for more posts from MOG’s curatorial team, including protecting art from fire, water, and pests! This entry was posted in Care of Glass, Uncategorized on May 6, 2016 by Museum of Glass. The educational movement known as STEAM (Science, Technology, Engineering, Art, and Math) made a visit to Museum of Glass (MOG) over the course of the last two weeks in the form of a class from kiln glass artist Shandra McLane. 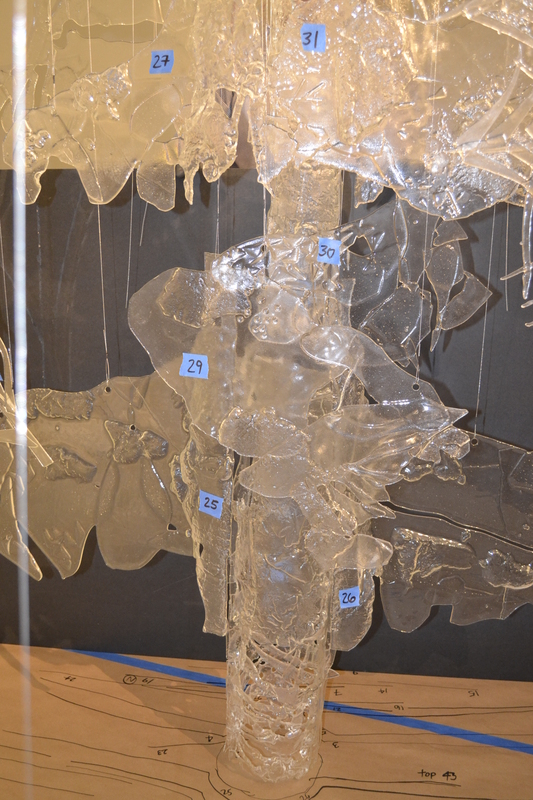 McLane and her team traveled from her studio, Squam River Studios, in New Hampshire to offer their self-designed curriculum, Engineering the Glass Seed, to a group of 23 high school students from Tacoma’s Science and Math Institute (SAMI) and Tacoma School of the Arts (SOTA). During the class, which ran for three days, the students built clay models of their seeds, created a plaster mold from their models, and cast the molds in glass to be fired in the kiln. The class covered a wide range of topics, including: design principles, ratios, color-tinting, and basic mold-building. This curriculum is a pilot program, funded by the Swedish American Exchange Fund Grant, and the Museum’s class was the third and final portion of the program. Dartmouth College in New Hampshire and The Glass Factory in Sweden also participated. Learn more about Squam River Studios. 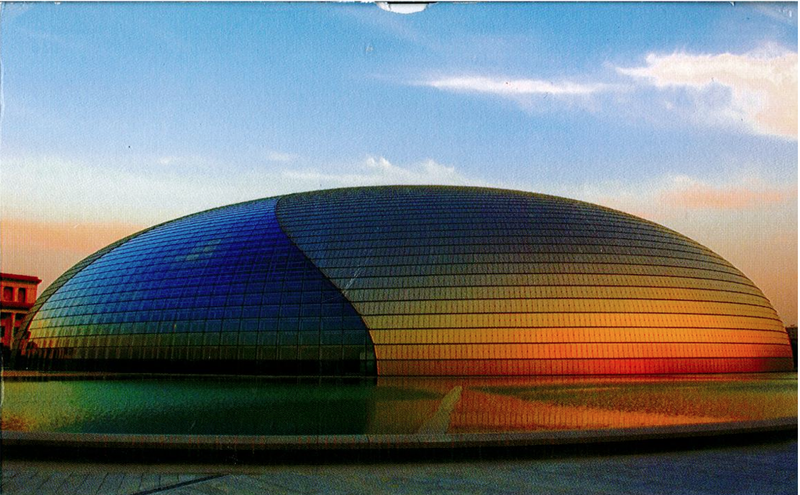 This entry was posted in Uncategorized on November 17, 2015 by Museum of Glass. Last September, Seattle-based artist Ethan Stern received the People’s Choice Award at the annual Museum of Glass Red Hot Auction and Gala. 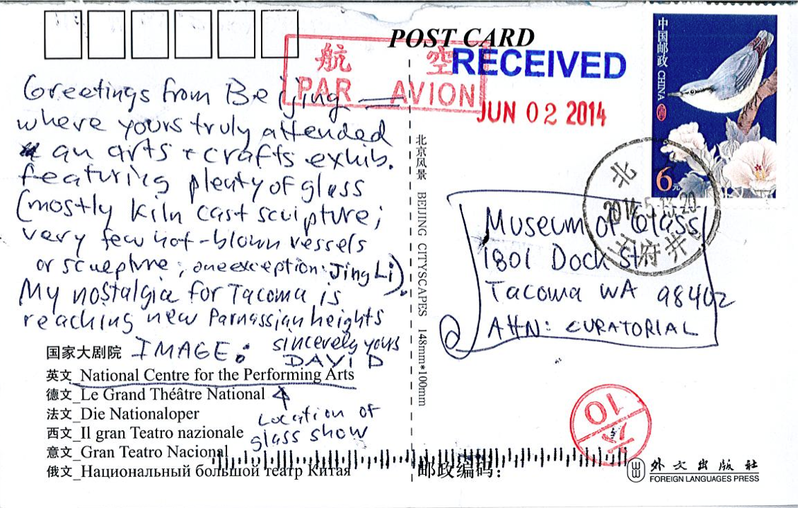 Stern won for his piece Verdant Sea, and was offered a 2015 Visiting Artist Residency as part of his prize. Stern studied ceramic art at both TAFE College of Ceramics in Brisbane, Australia, and Alfred University in New York, but soon found himself drifting toward the art of glass. While attending the Pilchuck Glass School in Stanwood, Washington, Stern began exploring techniques for engraving and carving glass, a process he continues today. 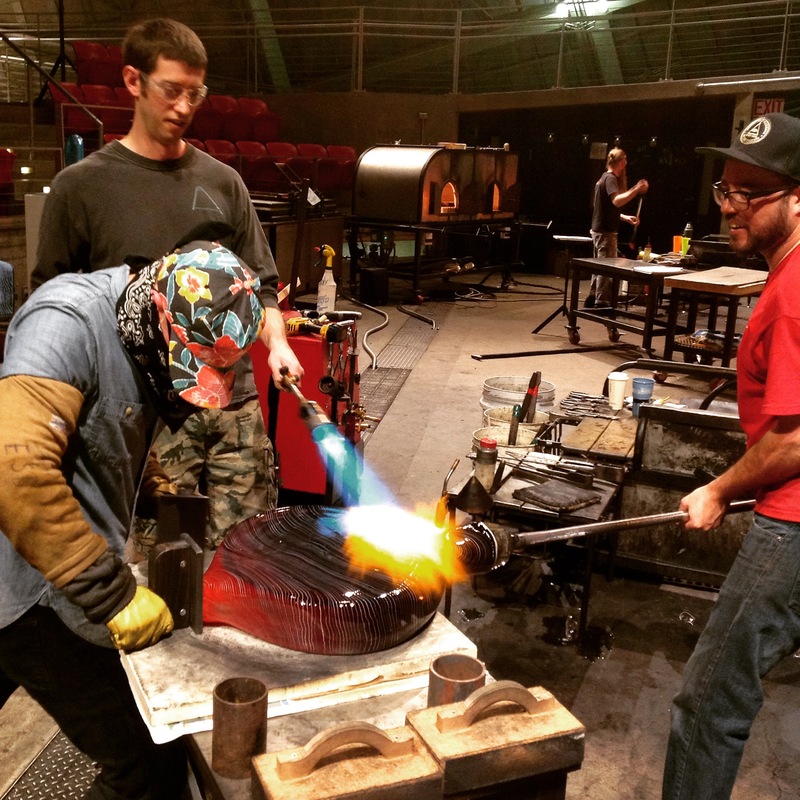 Stern began his five-day Visiting Artist Residency at the Museum this week and is working with the Museum of Glass Hot Shop Team to create pieces for both new and current series that he will eventually carve. Stern is experimenting with clear glass pieces for his new series Clear Coast, while also continuing his 2014 series Lunar Light. Ethan Stern (on the left, in the hat) working in the Hot Shop with Benjamin Cobb (left) and Gabe Feenan (right). 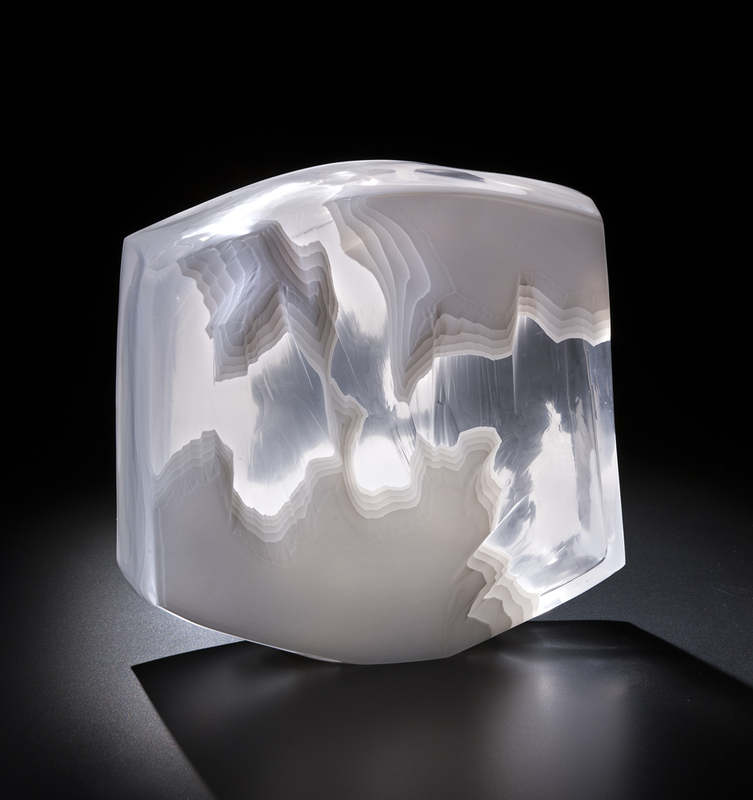 With the pressure removed, Stern has been playing with the scale and shapes of his Lunar Light pieces, departing from his more traditional sharper edges to create round, oval, and even teardrop shapes. And in contrast to the clear pieces he has made for Clear Coast, which he will later carve, Stern is also experimenting with layers of color as he revisits a previous project, Ice Coast, which Stern has previously made in white. 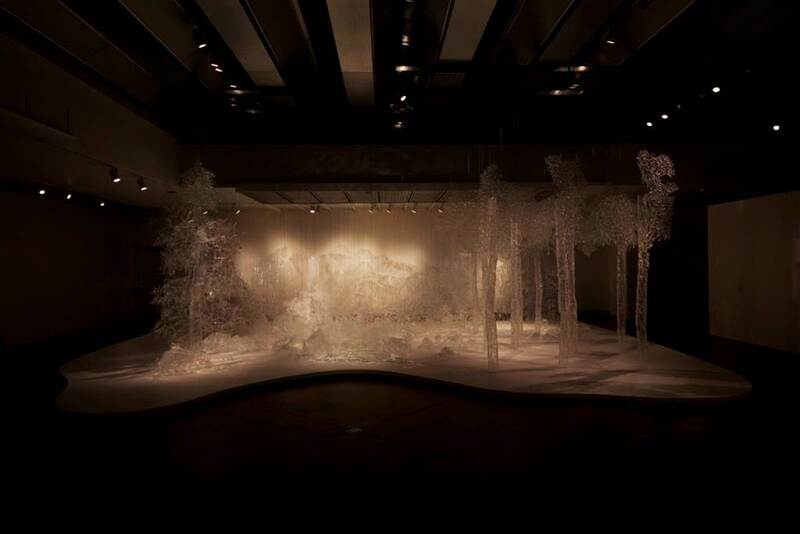 Ethan Stern; Ice Coast, 2013; 10 x 10.5 x 4 inches; Photo by Russell Johnson. 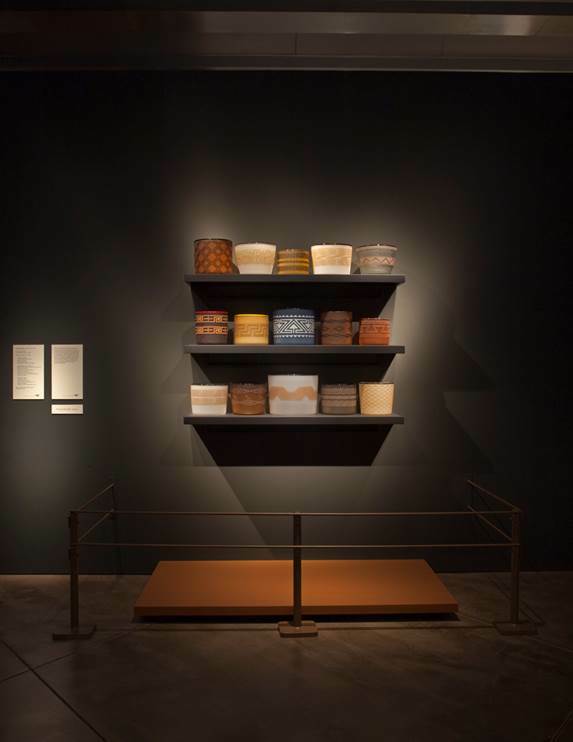 While he did not enter his residency with the intention of making pieces for a specific exhibition, some of the pieces may be included in two of his upcoming exhibitions in the fall and winter of this year, one of which is a show at Seattle’s Traver Gallery in September. Like many artists who exhibit their work and produce art in their own studios, Stern often finds himself tied to commitments, but coming to Museum of Glass to spend five days in the Hot Shop is a liberating change of pace. “The opportunity to make things outside of those commitments is energizing,” says Stern. To see him using this artistic energy in the Hot Shop, visit Museum of Glass on Saturday or Sunday, or tune into the Museum’s live stream. This entry was posted in Uncategorized on March 13, 2015 by Museum of Glass.